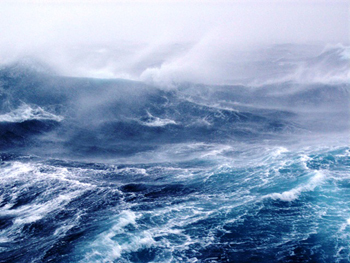 A fundamental shift in the Indian monsoon has occurred over the last few millennia, from a steady humid monsoon that favored lush vegetation to extended periods of drought, reports a new study led by researchers at the Woods Hole Oceanographic Institution (WHOI). The study has implications for our understanding of the monsoon’s response to climate change. The Indian peninsula sustains over a billion people, yet it lies at the same latitude as the Sahara Desert. Without a monsoon, most of India would be dry and uninhabitable. The ability to predict the timing and amount of the next year’s monsoon is vital, yet even our knowledge of the monsoon’s past variability remains incomplete. One key to this understanding lies in the core monsoon zone (CMZ) – a region in the central part of India that is a very sensitive indicator of the monsoon throughout the India peninsula. 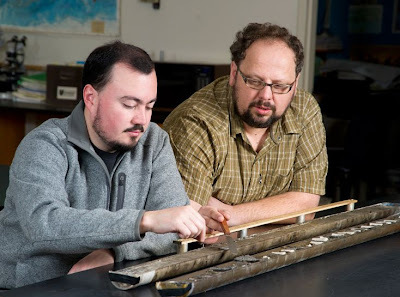 The study was designed by WHOI geologist Liviu Giosan and geochemist Tim Eglinton, now at ETH in Zurich, and makes use of a sediment core collected by the National Gas Hydrate Program of India in 2006. Sailing around India aboard the drilling vessel JOIDES Resolution for several months, Giosan enlisted colleagues from India and US to help with the project. Extracted from a “sweet spot” in the Bay of Bengal where the Godavari River drains the central Indian peninsula and over which monsoon winds carry most of the precipitation, the core has provided the basis for a 10,000-year reconstruction of climate in the Indian peninsula’s CMZ . When put together, the research tells the story of growing aridity in India, enables valuable insights into the impact of the monsoon on past cultures, and points scientists toward a way to model future monsoons. To assemble the 10,000-year record, the team looked to both what the land and the ocean could tell them. Contained within the sediment core’s layers are microscopic compounds from the trees, grasses, and shrubs that lived in the region and remnants of plankton fossils from the ocean. 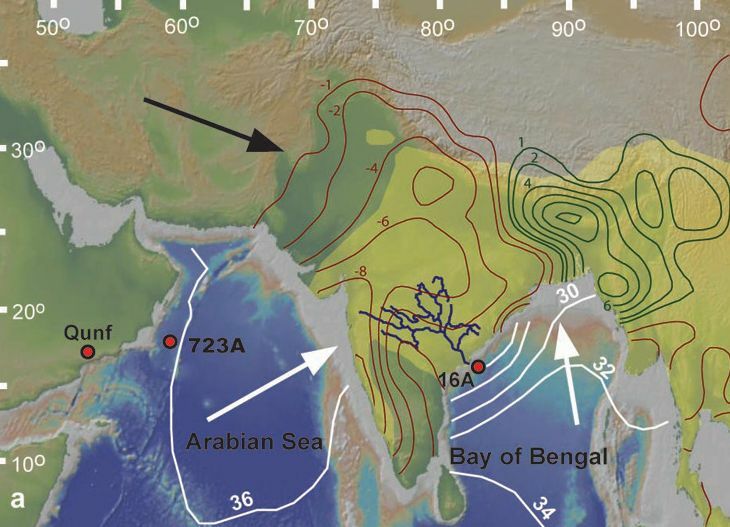 Analyses of the plankton fossils support the story reconstructed from plant remains and reveal a record of unprecedented spikes and troughs in the Bay of Bengal’s salinity – becoming saltier during drought periods and fresher when water from the monsoon filled the river and rained into the Bay. Similar drought periods have been documented in shorter records from tree rings and cave stalagmites within India lending further support to this interpretation. With a picture emerging of changes in the ancient flora of India, Giosan tapped archaeobotanist Dorian Fuller’s interest. 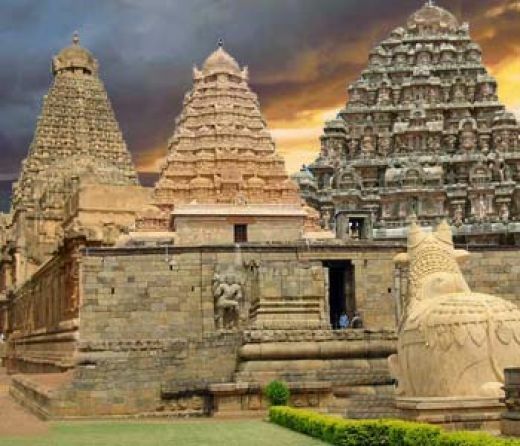 Together, the geological record and the archaeological evidence tell a story of the possible fate of India’s earliest civilizations. Cultural changes occurred across the Indian subcontinent as the climate became more arid after ~4,000 years. In the already dry Indus basin, the urban Harappan civilization failed to adapt to even harsher conditions and slowly collapsed. But aridity favored an increase in sophistication in the central and south India where tropical forest decreased in extent and people began to settle and do more agriculture. Human resourcefulness proved again crucial in the rapid proliferation of rain-collecting water tanks across the Indian peninsula, just as the long series of droughts settled in over the last 1,700 years. The study found that the type of monsoon and its droughts are a function of the Northern Hemisphere’s incoming solar radiation – or “insolation.” Every year, the band of heavy rain known as the Inter-Tropical Convergence Zone, or ITCZ, moves north over India.